Looking to buy a comfortable office chair under $300? Check this high-quality and good looking chair. This is the most perfect office chair under 300 bucks! Sitting a long time on typical office chairs can be devastating to your spine, neck and back. It can create lower back pain, wrist strain, neck stiffness, shoulder pain and even eye strains. Not to mention the lumbar area of your body will be in jeopardy too. When you analyze all the negative impacts of using a regular office chair, it will be a valuable decision to get an ergonomic office chair just by adding a few hundred dollars. In this article, we have reviewed the most fantastic ergonomic office chairs that cost less than 300 bucks. This article will unveil the most affordable ergonomic office chairs that have surprisingly superior features. So if you are looking for the best office chair under $300, you have come to the right place. Let’s check out this in-depth list of the top rated office chairs under $300! The Serta ergonomic office executive chair includes all the suitable features that you want from your office chair. The chair has a cushioned headrest, full leather back and cushioned sides. So it’s a kind of office chair that you must try if you have a budget around $300. The chair is made of top grade industry materials that ensure very high longevity. You can use the chair without having to worry about damaging your body or the chair itself. The framing of the chair is strongly built. So you can use the chair for years to come and not have to think about changing it any time soon. The chair has a unique health and wellness feature that is Active Seating Technology. This feature lets the seat and lumbar swivel with you like move on the chair. The function also duplicates the pelvic tilt exercise. It removes maximum seating discomfort and ensures a better and healthier work session for you. This chair has a dimension of 30 x 27 x 40.8 inches and a total weight capacity of the chair is 250 lbs. The chair is covered by top quality bonded leather, stitched perfectly with excellent finishing. The armrests of this chair are adjustable and it includes a super soft body pillow that gives ultimate comfort to the body. The armrests are designed to relax your arms, wrists and forearms altogether. At this price, you are probably looking at the best office executive chair. Smart lumbar support that moves with you. Comfortable sitting experience with layered pillows. The seat side leavers give great adjustability. Height is adjustable by one button. Pneumatic lift can lose tension after long usage. Warranty duration is just a year. At number two, we have a different kind of chair for you. Just like the name the chair even looks monumental. The materials are used to construct the chair are immensely strong and durable for high capacity support. This Hercules chair is an excellent choice for big users who want a durable and tough office executive chair for a long time. The tilt lock mechanism in this chair is pretty unique. You can adjust the tilt in the way that you can fix the inclination angle easily. So if you are a person who likes to stretch a little while working, you may consider this chair to be your trusted ally. The chair has a completely cushioned fabric so you will experience great comfort. Not to mention the flexibility you get for the fixed inclination feature as well. Furthermore, this chair is cautious about your lower back and posture issues. The built-in lumbar support of this chair protects you from sleep discs. Your busy arms are taken care of by the round shaped arms of the chair. The armrests are covered by top quality fabric and are carefully cushioned. This chair is formidable. Why? It has a dimension of 31 x 28 x 50 inches and a jaw-dropping capacity of 500 lbs. The seat of this chair is swivel, thick padded and wide. So you get a healthy and productive seating experience as long as you use it. The seat has a pneumatic adjustment lever that helps you to adjust the seat according to your comfortable height. Suitable for big and tall users. High capacity of 500 lbs. The backrest is high and comfortable. The armrest is removable and adjustable. The seat padding may appear little uncomfortable sometime. The Bellamy executive office chair comes in coffee brown color with state of the art layering. It is made of polyfiber and memory foam that gives terrific comfort to the users. The advanced layering system of this chair provides cozy cushioning. It ensures total support, comfort and firmness. The users of this chair can adjust their seat for better body alignment and customized body positioning. The chair has ergonomic features made for extended long working hours. Users can adjust the tilt and height easily and make the chair work according to their comfort zone. 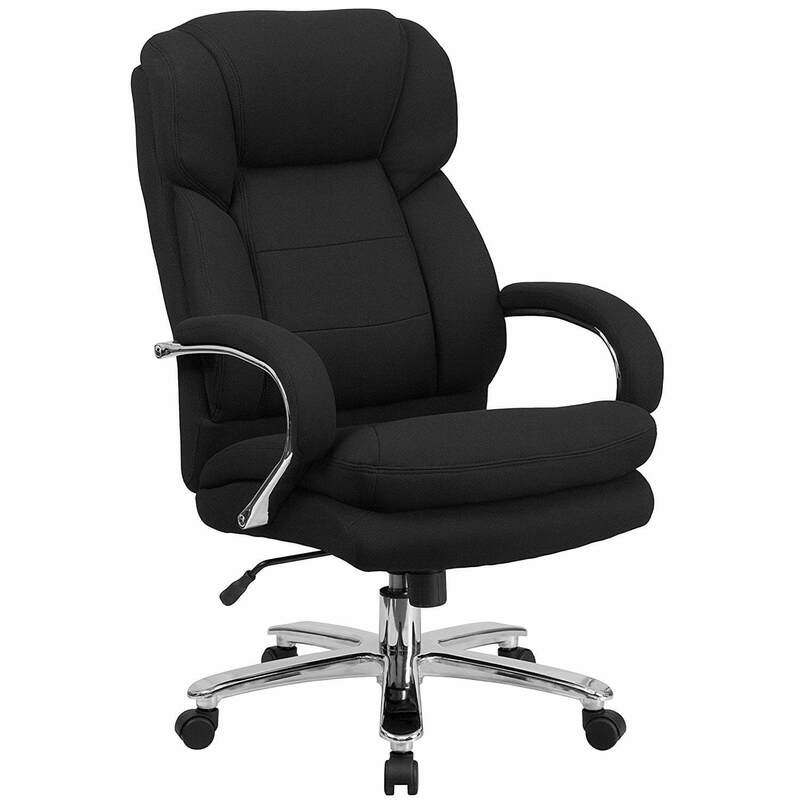 This fabulous office executive chair has a padded headrest and layered body pillows for supreme support. The assembling is very easy and the overall feedback from the consumer end of this chair proves its credibility. The chair is amazingly mobile with its Heavy-duty 60 millimeter casters. You can roll the chair on any surface and it can move around with you quickly. The chair has a premium wooden finish and covered by premium bonded leather. The overall built is super sturdy and durable. You can be assured that this chair is going to last a very long time even if you are using it harshly. Wooden components craft it and the overall look is a mix of traditional and modern style. The dimension of this chair is 31.2 x 27 x 44.5 inches and the weight capacity is 250 lbs. So it’s very much usable by users of any body size. The seat is made with a waterfall edge that helps leg circulation. The chair is made of soft and luxurious bonded leather. It offers a contoured cushions. The chair has a premium wooden finish that looks classy. The price is reasonable and attractive. Few users may find the assembling little uncomfortable. The lumber support can be a little discomfort to some users. The Siho office executive chair is a popular and trusted ergonomic chair for users around the world. The association of ergonomics application recommends this chair. The backrest of this chair is exactly as same as the human spine. It helps to release the pressure on the spine. Overall, SIHOO is a very comfortable chair to use. The backrest of the chair is tested and proven to be supportive for the back. Moreover, your shoulders will be helped too. You can adjust the backrest by moving it up or down. You will find a cozy lumbar pillow also in this chair. It eases the pressure of the lumbar intervertebral and lets you have a custom experience which you can enjoy while working. The seat cushion is made off original and soft cotton. The combination creates a super comfortable seating experience and ensures longevity too. The seat of this chair is made of Tilda mesh which is scratch resistant and is better than typical mesh fabrics. So you will have very less dirt or dust on the chair to clean. This chair has a dimension of 31.2 x 27 x 44.5 inches and a weight capacity of up to 250 lbs. So it’s pretty suitable for almost all size of users. It has a 10cm lifting and a rotation function of up to 360 degrees. The chair has a caster made of PU and rolls over the surface smoothly without leaving any damage behind. So, this is overall a high office chair at this price. Two way fine tuning healthy lumbar pillow. The design is based on human dynamic digital model. Super strong alloy air pressure rod used. The lumbar support may be little uncomfortable for some users. The SIEGES ergonomic office chair is in our top five lists in this review. It is one of the most recommended office chair under $300 in the market. This office chair includes plenty of ergonomic features that help the users to take care of their neck and spine correctly. You can adjust the chair according to your convenience. You can adjust the neck and head of this chair by its unique curvature. The chair is covered by high-quality mesh material and has a mesh back as well. It ensures proper air circulation while you are sitting. The seat is of mesh material as well making the chair breathable enough for a more extended period. The chair includes natural lumbar support and an adjustable back. It helps you to keep a perfect body posture while you are sitting and working for an extended period. The design of this chair is eye-catching. It has a balanced combination of style and fashion. So it fits your office interior easily. The capacity of this chair is 200 lbs and is made of quality mesh material. The wheels can rotate conveniently at 360 degrees and make multitasking much more manageable. The durable casters allow a great rolling and moving experience as it does not damages the surface. You can be mobile and move around without creating any disturbing noise. Assembling takes very little time. One of the best mesh chairs to use. Supports back and neck smoothly. Comes with all the necessary tools and nuts for assembling. Gives only 3 sitting position. Agromax mesh ergonomic office chair is a beautiful office chair which comes supplied with a set of premium-quality features and best of all it is super comfortable to use. There are three style variations for you to choose from – the first, as well as the most expensive one features a large back area and a comfortable, super convenient built-in headrest. The second style is a bit less expensive, but it features a larger, padded seat, as well as the headrest. The third style variation is the least expensive, as it offers less comfort and it features a smaller design. Whichever variation you choose, you can rest assured that you’ll be able to enjoy numerous benefits, including the superb comfortability, outstanding back support, easy setup and assembly, and more. Personally, I prefer chairs with adjustable armrests over the still, fixed one and this model met my needs without failure. The armrests can rotate forward or backward, allowing for a more versatile motion range, further boosting the overall comfortability. This office chair was ergonomically designed – it features an adjustable headrest, the back-lift function for your convenience and elastic lumbar pillow support. Basically, you won’t have to worry about tired legs or back aches ever again if you opt for this office chair. Last, but not least – this model is pretty durable. It features a nylon base adorned with glass fiber materials (tested for quality according to BIFMA standards). It can easily support a person weighing up to 330 pounds. Wrapping it up, I really liked how comfortable it felt sitting on this chair. It looks very modern and it’s sturdy enough for me to rely on it. There are some issues I’ve noticed as well – the annoyingly squeaking sounds might get on your nerves, but it’s nothing too serious. These sounds will cease once the seat “kicks in” the base, so you can only expect them to annoy you for the first few weeks. High comfortability – this office chair features breathable, exceptionally comfortable mesh materials. Choose from three style variations – three substantially different style variations are at your disposal, each coming with similar features with the exception of a single major change in the design. Very durable – the nylon base is capable of supporting people who weigh up to 330 pounds, and the chair is pretty sturdy altogether. Easy to assemble – even though minor assembly is required, you don’t need any special tools or skills. Remarkable value for the cash – this might be the best office chair under 300 dollars, as it boasts exquisite qualities and no significant drawbacks. Annoying squeaking sounds – you might experience unnerving squeaking sounds for the first few weeks until the seat “kicks in”. Sinking seat – this was supposed to be a convenience feature, but some people report not liking it. Office Factor is on my top 10 furniture brands list for several reasons. Namely, these guys make some of the finest office chairs out there and their ingenuity is something unique and exquisite and that’s an understatement. I often check for hidden gems through their catalog and I’ve stumbled upon a discovery which outshines the models I’ve used to love. Firstly, the most noticeable thing about this office chair is that it features a plain and beautiful design. Almost every feature of this chair is fully and easily adjustable, including the arms, the lumbar support and the seat depth. The only thing I didn’t like is the forward-tilted natural seat position – it is kind of makes you slide down but using the tilt-lock will easily get rid of this issue. Overall, I can surely say that this is one of the best ergonomic office chairs I’ve had the pleasure of testing out and I’ll warmly recommend it to anyone who needs a durable, comfortable chair. Exquisitely comfortable to use – this office chair excels at providing comfort, as it features superbly gentle materials and well-engineered construction. Durable enough to withstand years of use – as the materials used in the construction of this chair are gentle, they’re also firm and very durable. Good for the buck – if you’re looking for a bargain, you’re looking at one. Superb features – nearly all features of this office chairs are fully adjustable, including the lumbar support, the headrest, armrests and more. Great for everyone – slim, obese, mid-weight, it doesn’t matter how much you weigh; this chair is ideal for people regardless of their weight and size. The “natural” position of this chair feels a bit off – it kind of makes you slide away from the chair, but you can always use the “tilt-lock” feature to remove this issue. This office chair comes from the “Space Seating” brand – reliable folks who excel in making mid-priced office chairs and similar furniture. The model we’re looking at looks quite plain, but rest assured, it’s all but average. There are three style variations, including the “padded mesh seat”, “mesh seat” and “eco-leather” seat – the only differences are in the seat material. Even though the seat is very important, I was profoundly interested in the back area. It looked pretty and neat, felt quite gentle to the touch as well, but once I sunk into the chair, it quickly became one of my favorites. The back area features ventilated, breathable mesh materials which are very elastic and stretchy. They cushioned the back in the most ergonomic way possible, providing comfort while maintaining a healthy spine position. I was very pleased with the fact that this office chair not only comes with a built-in lumbar support, but this feature is fully adjustable as well. Depending on the style variation you’ve chosen, the seat will either feature padded mesh materials, plain mesh or eco-leather materials. Each of the aforementioned styles looks awesome and feels very comfortable but I’d recommend the plain mesh if you value minimalistic outlook or padded mesh for extra comfort. It doesn’t mean that eco-leather is inferior in any way – it’s just the design that didn’t quite feel so good. The waterfall-type leather seat wasn’t to my personal liking but you might find it as comfortable, even more than mesh. Anyhow, the only real issue is that there’s no headrest. Office workers spend hours stuck by the desk and the headrest feature really makes the difference – or the lack of it, in this case. That’s not a huge drawback, given that every other feature is pretty much near perfection, and I daresay that this is a best office chair under 300 bucks made by this brand. Impressively designed – this chair looks rather amazing, but the features it comes supplied with are impressive to say the least. Nearly every key feature is adjustable and the overall design boasts decent levels of sturdiness and durability. Three seat-style variations – you can choose between mesh, eco-leather, and padded mesh seat variations, each providing similar but substantially different qualities and benefits. Easy seat-height control – with the one-touch pneumatic adjustment, you can easily change the seat height. Outstanding level of comfort – it’s safe to say that sitting on this chair feels remarkably comfortable. Hardly comparable to similar models within the price range. Ideal for people who suffer from back pain – the adjustable built-in lumbar support greatly helps alleviate back pain and back aches. Minor issues with the eco-leather seat style variation – the waterfall-type seat kind of makes you slide down it, so I recommend using the tilt-lock to prevent such things from happening. No headrest – the lack of headrest is the only thing that you’ll find as discomforting regarding this office chair. Alera’s high-back office chair from the Elusion series resembles those chairs you can see in Sci-Fi movies. It features a futuristic, multifunctional design which is comprised of seat-glide adjustment, adjustable tilt (free-float tilt lock, forward tilt, and more), the contoured cushioned seat outfitted with a waterfall edge, poly pads, and more. First of all, let’s talk about the high-back seat design. This is undoubtedly one of the best ideas a furniture engineer could have and it’s quite obvious that it was converted into reality without fail. This kind of design is excellent in a plethora of ways, as it provides a substantial amount of comfort while riding you of back ache. Secondly, you’ll definitely love the breathable mesh back material. It’s comfy, it’s cozy and it slowly adapts to the shape of your spine, letting you sink into its cloud-like properties. Most people like leather office chairs more than mesh ones, but this one’s an exception in my book – it greatly outshines most leather chairs within the price range. The contoured cushioned seat is “responsible” for ultimate comfortability that this office chair provides. This remarkable feature further boosts the already-amazing level of comfort you’ll benefit from, making this the best office chair under 300 bucks, unparalleled and uncontested. Last, but not least, this office chair is very affordable, even by mid-range budget standards. Even though all chairs under 300 bucks are somewhat affordable, this one takes the term “bargain” onto a whole new level. Overall, the only bad thing you can expect is the squeaking sound this chair makes. This little flaw is easily taken care of though – just tighten the joints a bit stronger and you’ll be rid of this menace in no time. Outstanding level of comfort – the premium-quality mesh materials are superbly comfortable. Very affordable – this office chair is pretty cheap, even by mid-priced standards. Holds a huge value for the cash – all things considered, the potential benefits greatly outweigh the small flaws that come along. Superb features – various adjustable, reliable features come outfitted to this office chair. Great back support – ergonomically designed, this office chair works wonders for your back aches and pain. Annoying squeaking sounds – this small issue can be dealt with by tightening certain joints. The last office chair in this review comes from Viva office – it’s a high-back chair which includes mesh materials and adjustable features, boasting a huge value for the money. There are plenty of things I liked about it, among which the most important are the ergonomic design, superb-quality mesh materials, the high back construction and a remarkable outward appearance. In fact, this might be the single most beautiful office chair within the price range – it features breathable mesh materials on the back, seat and the headrest sections, all neatly packed into a beautiful package. The high-back design provides additional back support and excels in alleviating back pain, which is pretty much, everything that an office worker needs. What’s more, this office chair was designed to be mod-friendly – you can perform your own modifications in whichever way you see fit, as it comes supplied with a plethora of adjustable features (lumbar support, headrest, armrests). The base features premium-quality nylon materials (both the actual base and the casters) – these sturdy features provide excellent durability and increase the overall stability of the chair. Even though this office chair needs to be assembled when you get it, the job is pretty trivial, requiring no special tools. Personally, I loved the free component exchange this brand offers. Namely, you’ll get a free replacement for any broken part within two years after the purchase. Overall, I have no negative comments about this one – it’s decently cheap, remarkably beautiful, tough as a rock, and does the job perfectly. Exquisitely beautiful – this chair features a ravishing outward appearance. Ergonomic design – each feature of this chair was specifically engineered to provide extra comfort and back support. Easy to assemble – you don’t need any special tools to assemble this office chair. Premium-quality features – nylon base and high-quality mesh materials make up the construction of this office chair. Highly durable and sturdy – this one will be able to take quite a punishment before even denting. No remarks – this chair is nearly perfect and it doesn’t come with any notable major flaws or drawbacks. Your chair should be able to cope up with your body type, sitting position and angles the way you want. You should also be able to control the lumbar support of the chair. The height adjustability is also an essential feature in this category. We are not same at physical appearance neither is our office desk. So it’s significant that your chair is adjustable to your comfort. Your body releases moistures when you sit. It’s not like you sweat heavily, but if your seating area is not bypassing enough air, you will be in a very uncomfortable situation. Moreover, your chair will start to the gamer and also have odor problems. Overall, breathability is essential for your chairs longevity and comfort. Your chair must be able to fit your entire working process. It should be able to support your neck, spine and body appropriately. You should be able to move quickly with the chair, lean back & forth, adjust the height, armrest, footrest, backrest and also sitting positions. Overall, the chair should be able to support both your work and health. This is a little tricky. Leather materials are long lasting but fabrics are much more breathable. Moreover, leather chairs are more expensive as well. So if you have the budget and you are comfortable in less breathable but long lasting chair than leather chairs are ideal. The bottom line is the material of the chair should be of high quality no matter what it is. This feature will allow you to adjust the back of your chair to any angle and degree that fits best to your needs. You should be able to lockout the chairs back by any angle. It will give you the freedom to sit the way you are most comfortable. It should also be able to lean when it’s not locked. It’s not a must-have feature for a great office executive chair. However, having adjustable armrest can give you extra comfort while you are working for more extended hours no stop. This feature helps you to accommodate yourself with desks of any height. We all use chairs to sit and that’s the primary purpose of it. So the seating area of a good office chair is a critical consideration factor. You will be spending long hours sitting on your chair while going through all the daily tasks at work. Therefore, before buying an office chair always check the padding on the seating area, size and how supportive it is for long sitting hours. The middle price point category spans roughly from $101 to $299 and these two hundred in between mean a lot. Namely, there are plenty of differences between the most affordable mid-priced office chair, and the most expensive one. Good stuff got a price and that is the truth. A good office chair is kind of a long-term investment you would make just like great furniture in your home. However, be aware of overpriced office chairs that do not live up to what they promise. So before buying an expensive office chair, please asses your requirements first. If you find an excellent office chair at a reasonable price that fits your needs, there is no risk in buying that one. Those brands that make mid-priced office chairs invest more in the material, so it’s only safe to assume that these models will and do look better than your average, casual office chair. Even though looks aren’t the most important factor you ought to consider, but they’re surely at least somewhat important. Your mid-priced office chair should be able to withstand not only months, but years of use. A durable construction is the least you should expect and don’t settle for less for any reason. A durable chair is the one which is usually easy to assemble but tough to disassemble, the one that won’t squeak too much and the one that pretty much remains in place regardless of how you tilt it. Prioritizing only mesh material: There is no doubt that mesh materials are great and reasonably priced. However, there are plenty of awesome fabrics and designs which are not mesh but lasts long. Other fabric chair does not mean that’s a bad chair in anyways. Prioritizing looks only: You want a beautiful chair just like everyone else. The look is critical. But that should not be the only important factor to consider while buying an office chair. Remember, looks are just the fraction of the story when it comes to ergonomics. So checking the quality, durability and functionality are more important. Prioritizing price: Everyone has a budget and that is very obvious when buying furniture. Nevertheless, before budgeting or determining how much you are willing to spend on an office chair, make sure you first list your requirements and what kind of support you expect from your chair. Thus, you will be able to strike the best deal for you. So which is the best office chair under $300? The answer will depend on three factors: ergonomics, price and look. That being said, our list here in this article is comprised of only the best and most tested office chairs in the world. If you are selecting any of the chairs as your pick for today, you won’t be disappointed. Nonetheless, make sure you go through the features, pros & cons of all the chairs before you decide which one fits you the best. I hope that you’ve found the review of the best office chair under $300 helpful, and I warmly recommend these ten chairs. Each model I’ve reviewed has passed the little “quality test” – the criteria I’ve mentioned in the “buying guide” section above.